Toys 'R' Us to Sell iPad 2 in May? The iPad 2 may delight children of all ages, but is it really a kids' toy? And will parents buy Apple's delicate and expensive (by toy standards) tablet computer for their kids to use and abuse? We may soon find out if a Wednesday report from ModMyi.com, an online community of Apple iPhone and iPad users, turns out to be true. The site says that Toys"R"Us will begin selling the iPad 2 in May, according to a loose-lipped employee of the toy-retailing giant. "Although there have been rumors in the past about Toys "R" Us possibly carrying the iPad at some point in the future, this is the first we've heard from an actual employee that an iPad launch at the toy store is imminent," writes ModMyi.com staff writer Michael Essany. 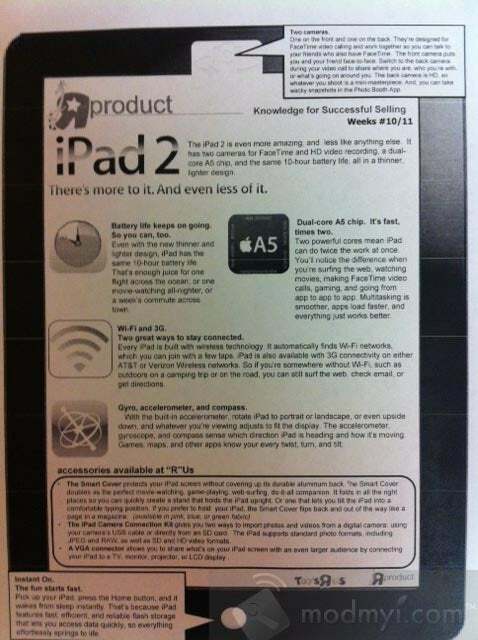 The site provides two photos to support its story, including an alleged iPad 2 fact sheet for Toys "R" Us workers. A number of brick-and-mortar retailers, including Best Buy, Target, and Walmart, already sell the iPad 2, so the addition of Toys "R" Us isn't much of a stretch. But is the iPad 2 really kid-friendly? PCWorld senior editor Tim Moynihan stress-tested the original iPad a year ago, and the results were ugly. While the screen was scratch-resistant, the iPad's back was very scratch-prone. A bath of Starbucks coffee didn't destroy the iPad, but a soap-and-water scrubbing "hosed" the touchscreen, as well as the home and power buttons. In a series of drop tests--the sort of thing kids do with their toys every day--the iPad's glass display shattered quickly. In fact, three drops onto a carpeted floor damaged the tablet. "Honestly, it broke kind of easily...if you get an iPad, you're definitely going to want a protective case for it," Moynihan said. And lest we forget, the iPad 2 is lighter and thinner than its predecessor. Of course, the age and maturity of the child will factor into the iPad 2's survival rate. But you've got to wonder how many parents will want to shell out $500 or more for a pricey and fragile kids' "toy." And if they do, which case will they buy? The DreamGear Elmo Plush Portfolio ($40) will delight preschoolers, but it doesn't appear rugged enough. The Speck iGuy Standing Cover ($40) is cute, but is it strong enough to protect the iPad 2 from a kick down the stairs? Perhaps the RAM Rugged Handi-Case ($71) is the answer, although it doesn't look particularly kid-friendly. Me, I'd buy the $15 Etch-A-Sketch Freestyle instead.